That’s right, a salmon and quinoa dinner made in under 20 minutes. And with just 6 ingredients! Three power foods, prepared fast, tasty and easy; This meal is also easily adjusted to your own personal needs. Boil water and quinoa according to package directions. While quinoa cooks, dice and sauté zucchini in olive oil. Drain canned white beans and canned wild salmon. 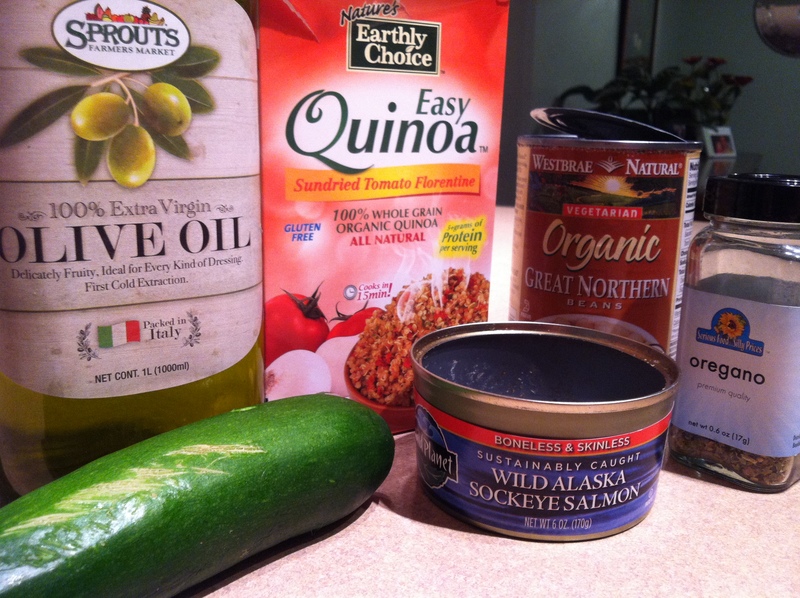 When quinoa is cooked, mix quinoa, zucchini, salmon and beans together. Serve 1 1/2 cups with a colorful salad. One of my favorite concepts for healthy eating is to balance your plate. Fill half your plate with non-starchy vegetables and the other half with high-fiber carbohydrate and healthy protein or fat. To balance my plate I served this Quinoa, Salmon and Oregano Zucchini with an arugula and tomato salad because this recipe is a bit light on veggies. If you’d like this to be a stand alone meal or if you are trying to eat more vegetables or if you are trying to lose weight, use 3 zucchinis and add 2 bell peppers. If you are eating a higher protein and lower carbohydrate diet, use more vegetables and 2 cans of salmon. If you are active and eating a higher carbohydrate diet, use the whole can of white beans. By increasing and decreasing the different components of this meal, you can adjust it to meet your own nutritional needs.